Dr. Jorgensen is a seasoned scientist with a diverse background in chemistry and material sciences. Currently he focuses his efforts on using extractable and leachable chemistry in the evaluation of medical device biocompatibility. His academic work focused on synthesis and characterization of biomimetic materials, fabrication of microscale devices, and photonics. He has a professional interest in both technical and popular science writing, which has produced over 30 peer reviewed scientific articles and hundreds of blog articles. To characterize materials Dr. Jorgensen has extensively used a wide variety of techniques including GC/MS, LC/MS, FTIR, UV/VIS, SEM, NMR, and several types of advanced spectroscopic techniques. His PhD in Physical Chemistry from the University of Utah was based on the fabrication and analysis of titanium dioxide and silicon dioxide photonic crystals templated from the three-dimensional structure found in the exoskeleton of exotic weevils. 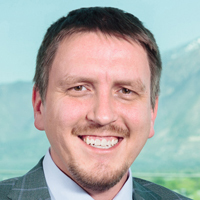 During his time at the University of Utah, he received the Henry Eyring Research Fellowship, the DOW Chemical First Year Scholarship, and additional grants to travel and present his research at national and international conferences. Dr. Jorgensen taught Quantum Mechanics and Thermodynamics as an assistant professor at Southern Utah University, where he developed new lecture and lab courses in these subjects. Following his time at Southern Utah University, he received an Alexander von Humboldt research fellowship and an offer to head a group of scientists in Germany. His work at the Leibniz Institute for Solid State and Materials Research in Dresden involved the management and supervision of the research projects of seven PhD students and postdoctoral researchers. The group’s research focused on fabrication and application of devices using rolled-up nanotechnology. Rolled-up nanotechnology extensively involves photolithography, deposition techniques, and selective etching in a cleanroom environment. Structures were characterized using scanning electron microscopy (SEM) and advanced spectroscopic techniques in addition to exploratory calculations using finite-element methods.